Home / Adviart Blog / Get lots of calcium! Get lots of calcium! This adviarter took a shell with a large surface area to draw our her advice. Over time, we need more and more calcium so that we don’t deteriorate. 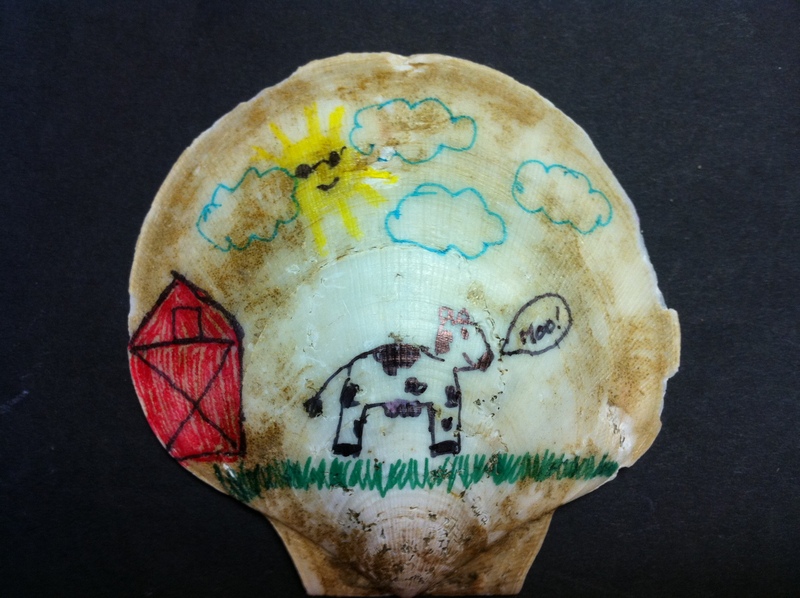 This adviarter told a story about her nephew and used multiple colors to draw the story of her advice across the shell. The sun is smiling. The barn is red. Getting calcium is an interesting piece of advice, a necessary one. However, it represents a larger piece of advice to me. Specifically, we need to think about health overall in order to ensure that we do not deteriorate. Calcium is certainly a mechanism to keep deterioration from happening–though there are other things that we can do as well on a daily basis. This adviart shows me the power of a story–using all pictures and color to express a concrete thought. So how do you go about ensuring you don’t deteriorate? Do you consciously think about your calcium intake?